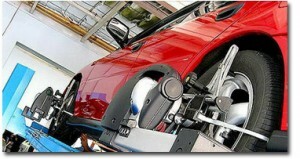 Many times people think that a wheel alignment and balance is not a necessary service. In fact, these simple services can be critical to the wear and tear of your tires. While tire wear is just a part of having a car, especially if you just drive short distances, keeping your wheels in alignment is critical for good tire maintenance and saving you money in the long run. Why do a wheel alignment and balance? Without wheels that are properly aligned, you may risk a dangerous blow out. In addition, wheels that are balanced and aligned ensure excellent gas mileage. How often do you need to have your wheels aligned? The auto care experts at the Seven Hills Rad Air Complete Car Care and Tire Center believe that wheels need to be checked for alignment every 12,000 to 15,000 miles. What might you experience? Tires that aren’t aligned properly can cause you to experience many different symptoms. You may fight the wheel when steering and notice that your car drifts right or left if you take your hand off the steering wheel. Avoid damage! Misalignment due to poor balance of the tires can cause a great deal of damage to your car’s frame, issues with tire wear and can even cost you in fuel economy. The tire specialists at the Seven Hills Rad Air Complete Car Care and Tire Center can determine if your car needs this service and get it done quickly and affordably. Save time and money with our Rad Air Complete Car Care and Tire Center wheel balance and alignment in Seven Hills. Don’t risk a blowout, difficulty steering or pay more at the pump. Come in today!